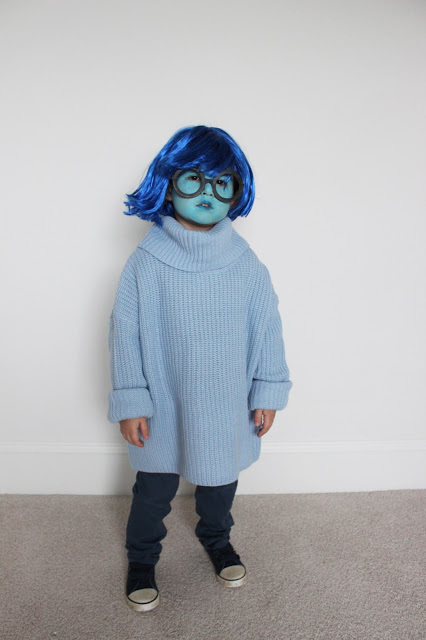 Have you seen Inside Out? It’s. So. Good. 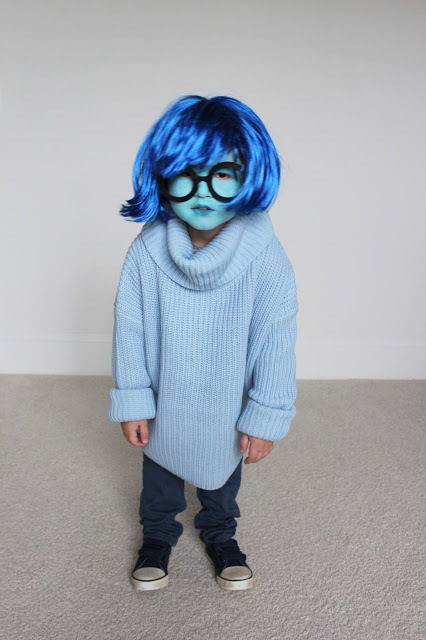 If you’ve seen Inside Out and didn’t cry, then you are a robot my friend. 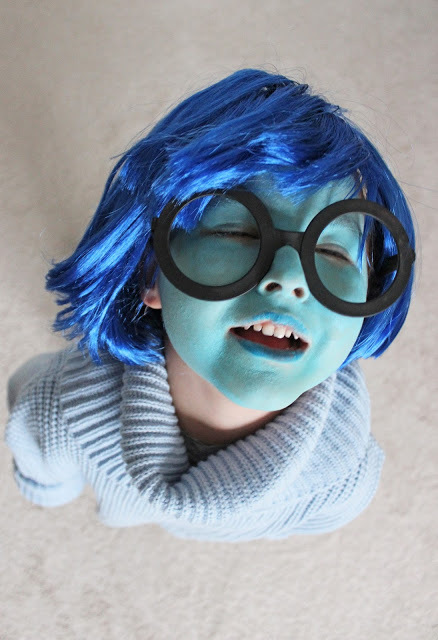 Sadness is my son’s favorite character! He just thought she was hilarious. He has a stuffed Sadness doll he sleeps with every night and makes up jokes and songs in her voice. 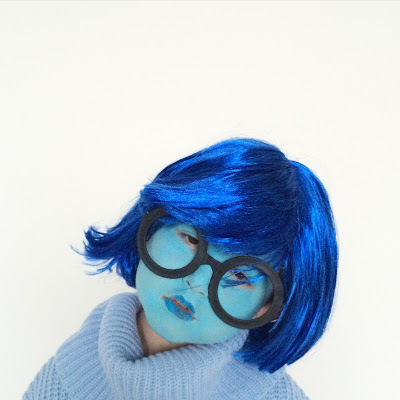 He’s having a Sadness-themed birthday party next month and it was an obvious choice for Halloween! 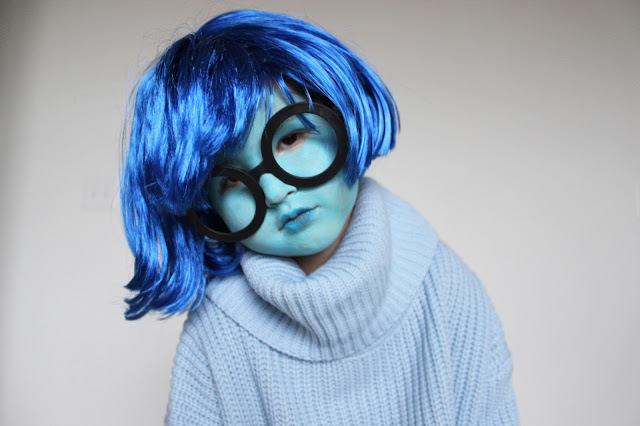 Try to find a Sadness costume. Just try. They don’t exist. So let’s make one, shall we? 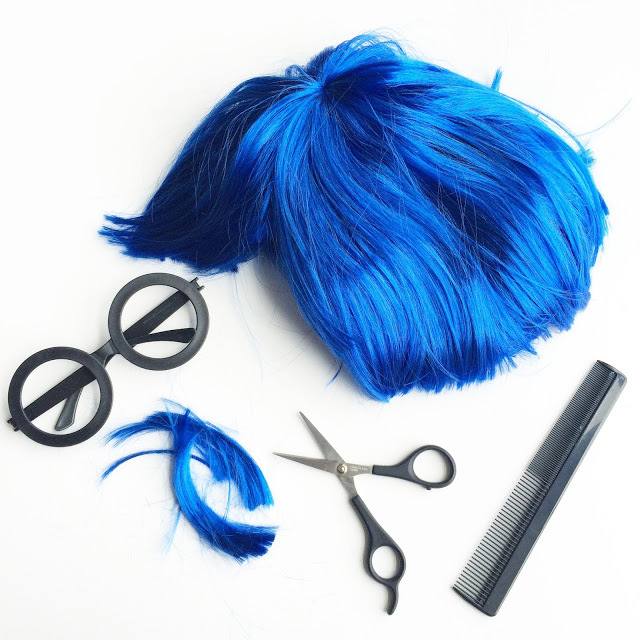 First, you’ll have to give your wig a Sadness haircut. THIS is the one I ordered. The quality was amazing but it’s NOT at all what it looked like! It was super long! Chop the right side and the back short and straight across. The left needs to get longer in the front. I trimmed the bangs to just above Ari’s eyes. Then I used a curling iron to flip up the ends on long side and swoop the bangs over to the left. Spray with hairspray to set. I ordered glasses from Amazon and they came in totally different from the image, but they worked really well I think. There are NO children’s turtleneck sweaters anywhere! This is a woman’s sweater from Forever 21 that I’ll probably keep for myself. The face paint went very easily and dried quickly. A little tricky to get off, but Ari didn’t seem to mind! Shoes are old! Any blue shoes will do.